As a Lexmark Business Solutions Partner, Midshire can supply a wide range of Lexmark photocopiers to suit a variety of business needs. Whether you need your photocopier to be mono or colour, A4 or A3, the Lexmark range of photocopiers for businesses is extensive. Midshire can provide you with desktop Lexmark photocopiers for small workgroups with restricted space, or large floor standing photocopiers, that are able to cope with bigger print volumes and are suited to larger teams and office environments. Also known as multifunction printers, Lexmark’s photocopiers have all the functionality an office could need. In addition to printing, these devices also scan, copy and fax. We specialise in the smaller desktop photocopiers; however, these can easily be adapted with additional paper trays into freestanding models. Lexmark devices are designed with your brand in mind. Every colour device from Lexmark comes with named colour replacement as standard, based on the Pantone colour matching system, meaning that you can be sure that your colour printing is consistent and matches your corporate colours. It is also important to consider ease of use. 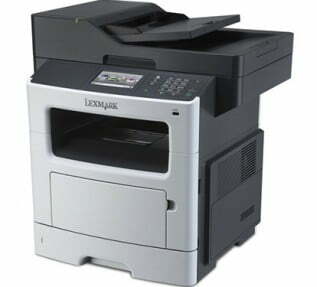 Many of the Lexmark photocopiers have intuitive touch-screens, providing tablet like productivity. You can even create custom messages and displays to help users with the essential functions they use every day. A Lexmark Business Partner since 2012, Midshire is fast becoming a key associate and reseller of Lexmark all-in-one printers and business solutions in the UK. Midshire sought to add Lexmark to our portfolio of brands to offer our customers the greatest selection of diverse, cutting edge, business equipment and solutions. The Lexmark all-in-one desktop printers and copiers, printing apps and solutions available through Midshire ensure our customers have choice, flexibility and a value for money service. Working with Lexmark UK we can offer a vast range of business solutions and apps to develop new ways of working for our customers. All Lexmark photocopiers can be placed on a Managed Print Service, where we take care of the full print solution, allowing you to focus on your business. A Managed Print Service is a bespoke photocopier and printer service that covers general maintenance, the ordering and supply of toner cartridges and parts, preventative maintenance, the booking of engineer calls and automated collection of meter readings, plus anything else your business requires with regards print management. Midshire offers the lease option across our entire range of print solutions, including Lexmark photocopiers. A printer lease spreads the cost of your device over 3 to 5 years. You will pay fixed equal amounts, either quarterly or monthly over the fixed term, instead of making the large full payment at the point of receiving the equipment. Financing your equipment via the lease option offers flexibility to upgrade your devices at a later date and offers tax benefits for business, making it the most popular choice for UK companies.